Successfully Added Vacuum Smartphone Holder - 360-Degree Rotation, Fit For All Phones, Plug And Play to your Shopping Cart. Conveniently hold your smartphone in place and attach it to any surface with this silicone vacuum smartphone holder. Built out of durable ABS material, this phone holder comes with a powerful and stable silicone vacuum suction surface that allows you to attach it to any smooth surface out there. Perfect for usage in the car or at your desk – with this smartphone holder you’ll always have your mobile device at hand and ready for use. With its easy to use design, this vacuum smartphone holder can be attached anywhere by simply pressing it to a smooth surface. Its durable silicone sucker has been created out of high-end material – providing you with a stable platform that is guaranteed to stay in place. When attached to your car dashboard or window, this smartphone holder conveniently allows you to display your smartphone and use it whilst driving for GPS purposes. Additionally, it can be used to keep the phone in place for your passengers that would like to enjoy a movie while sitting in the car – waiting to reach the upcoming destination. Thanks to its silicone suction design, this car smartphone holder does not make use of any magnets or glue based materials – making it safe to use and guaranteeing that your smartphone will be treated gently. 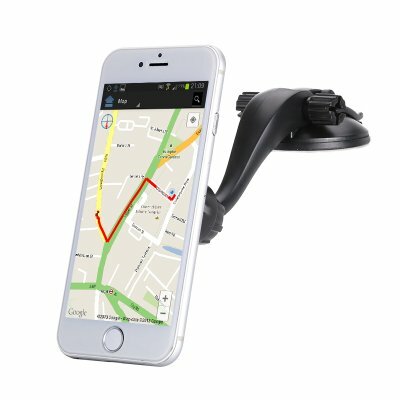 Its innovative stand can be rotated 360 degrees and additionally allows you to adjust the angle – assuring that, once the holder has been attached to your dashboard or window, you can rotate it around and adjust the viewing angle of your smartphone without needing to detach the holder itself. Fitting all smartphones out there, this useful gadget for in your car is the perfect smartphone holder that brings along great in-car convenience. This smartphone holder comes with a 12 months warranty, brought to you by the leader in electronic devices as well as wholesale electronic gadgets..
Arabic: - حامل الهاتف الذكي - Chinese Simplified: - 智能手机持有人 - Czech: - Držák smartphonu - Danish: - Smartphone indehaveren - Dutch: - Smartphone houder - French: - Support smartphone - German: - Smartphone-Halterung - Hebrew: - מחזיק החכם - Hindi: - Smartphone धारक - Italian: - Porta smartphone - Japanese: - スマート フォン ホルダー - Korean: - 스마트폰 홀더 - Malay: - Pemegang telefon pintar - Norwegian Bokmål: - Smartphone holderen - Romanian: - Titularul de smartphone - Russian: - Смартфон держатель - Spanish: - Soporte de smartphone - Thai: - เจ้าของสมาร์ทโฟน - Turkish: - Akıllı telefon tutucu - Vietnamese: - Người giữ điện thoại thông minh. Very good packaging, safe and secure. I want to try it on my phones.